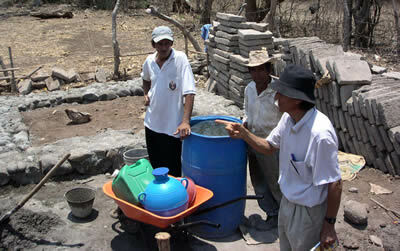 The earthquakes of January and February 2001 destroyed thousands of homes in the small nation of El Salvador . There have been strong discussions concerning the appropriate technologies and materials for quake-resistant building and people are insecure. In two villages of the municipality of Tamanique , 30 families have taken the initiative and are building their houses with an ancient technology. 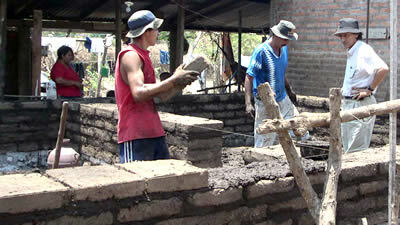 However, they are using today's knowledge to make sure that their houses won´t fall apart during the next earthquake. Since the earthquakes many ideas have been tried in the country, and the inhabitants of Tamanique have listened to the messages from builders and vendors of construction materials, anxious to obtain their business. They also have heard of new technologies, which should be quake-resistant and economic, and some of them have had the experience of living in such show houses. But, the houses built of ferrocement not only turned out to be hot and expensive, they also had cracks, not so much for being a bad technology, but that it was applied without knowledge. Some constructions made of brick or cement blocks have cracked after a short time because of poor quality of construction. Many funds have been used to raise insecure or defective houses. A federal investigation after the earthquakes came out with the result that the incidence of damage in the houses with mixed technology (walls made of cement blocks and/or bricks with concrete columns) where greater than in the houses built from adobe. This shows clearly that the quality of construction, or, better said, the manual labour, was better in the past than during the two last decades. When the women from the local organization Cocredet brought the inhabitants of the village La Victoria the good news about financing, they had a good discussion on this theme. But when Andrés Escudero, the project manager, started to talk of improved adobe he experienced a total rejection. The neighbours took him to visit a community center, which had been built just a couple of month ago under the instructions of an international NGO and which had severe damage. 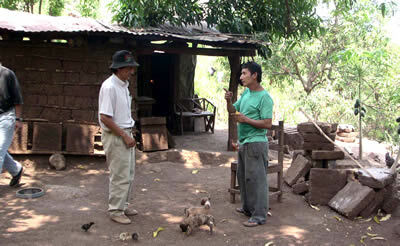 It is a construction based on a wooden structure, which is filled with adobe. The wood already had signs of rotting, the wind had moved the zinc sheets and the roof structure was damaged, the cement and lime based plaster is falling in large pieces from the walls and the adobe has cracks in various places. Andrés had to assure the community, that these were not the type of inventions he means by adobe construction, rather, he explained that in that model a series of errors had been committed, which never should have been made. Because these rural families are realistic, they know that adobe is their only chance to get a dignified house, as the costs for buying materials would exceed their possibilities and just the transport to their housesin the mountains would have been an impossible barrier to overcome. However, this discussion took its time and the project started late, in the midst of the dry season. In the meantime, the walls for two houses have been built and the roofs are being mounted, with more to follow. Other families have decided to use the winter period (rainy season) to get rocks and sand, and be prepared to begin adobe production at the start of the next dry season in November.